So why is this among the most exciting cars to come to market in at least a decade? Well, for one it’s among the greatest American motorcars ever made and two, it’s been in a long-term collection that you’d think would never consider parting with it. More on that in a minute. The SSJ was the ultimate evolution of the already-amazing Duesenberg Model J. The Model J transformed into the awesome “SJ” when a supercharger was added. That bumped power from 265 to 320. Duesenberg developed two “SSJ” cars – they were also supercharged and had an exceptionally short wheelbase. Power from the supercharged 6.9-liter straight-eight was bumped to 400 horsepower for the SSJ, thanks to parts borrowed from the “Mormon Meteor” land speed record car. 400 horsepower. In a road car. In 1935. How are you still even reading this? Shouldn’t your mind have been blown by this point? It would be another 20+ years before American roads saw that kind of stock horsepower again. These two SSJs – this one, the first one, was sold new to Gary Cooper. The other one, in 1936, went to Clark Gable. The legend is that they would race these two Depression-era supercars in the Hollywood Hills. The fact that these two huge stars both got one of these cars is no coincidence. Duesenberg thought the publicity might help save the company. Unfortunately, it didn’t. Cooper only kept the car a short time (and reportedly had it repainted shortly after taking possession) and it had seven other owners before Briggs Cunningham acquired the car in 1949. In 1986, Cunningham’s collection was sold to Miles Collier and it’s been a highlight of that collection since, spending quite a while on display in the Revs Institute in Naples, Florida. It was at this extensively-financed museum that I pretty much assumed this car would stay forever. But it isn’t. Anyone can buy it – well anyone with “In Excess of $10,000,000+,” as Gooding & Company hilariously estimates it will bring. At any rate, it’s an iconic piece of American motoring history that might get locked away again for a long time. It’s exciting to see something like this come out from behind the doors of a big collection. Click here for more info and here for more from Gooding & Company. 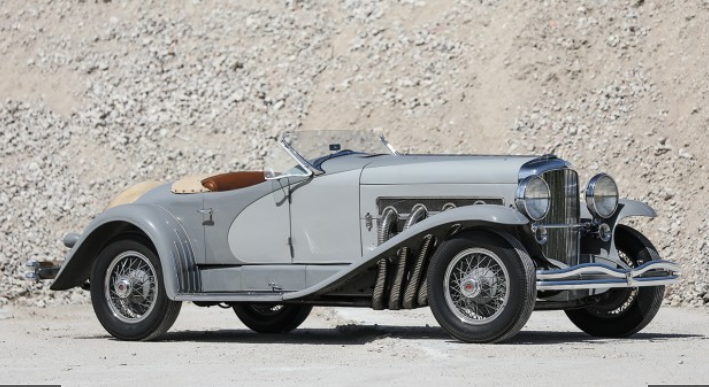 This entry was posted in Uncategorized and tagged 1935, auctions, cars, classic cars, duesenberg, gooding & company, j-563, lagrande, model ssj, speedster by classiccarweekly. Bookmark the permalink.